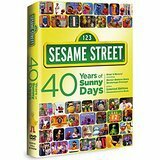 Sesame Street: 40 Years of Sunny Days: This DVD will take you back to before you were born; when Oscar was orange and Big Bird was a dodo. All you favorite clips are included like C is for Cookie, The teeny little super guy, Healthy Food, Super Grover, Tony and Maria's wedding, and more. Show your kids the real Sesame Street when is longer than 30 minutes and wasn't all about Elmo. The Care Bears Movie: Remember watching the drama unfold when the Care Bears had to show Nicholas how to care? Yeah, me too. Mostly because we own this movie and my son regularly requests to watch it. With fun songs and cute characters, you can't go wrong. Willy Wonka: Because it would be a travesty for your child to think the Johnny Depp version is the real Willy Wonka. Don't get me wrong I love Depp. So does my son. He is great to sing along with in Sweeney Todd, or watch in Edward Scissorhands. But Gene will always be the real Wonka. The Muppet Movie: If you think Amy Adams is in this movie, then you are not the right age for this list. This is the original. The movie when Kermit and the gang seek their fortune in NYC and try to get their show produced. Its puppets and songs, how can you miss?! Some other DVDs include The Brave Little Toaster, Fraggle Rock, and of course you can't go wrong with classic Disney! 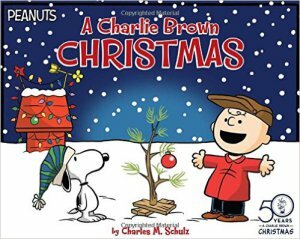 A Charlie Brown Christmas: This story is a classic from before our time. But we grew up on it. The scraggly Christmas tree was a part of every Christmas. Make sure it's a part of your child's Christmas too! The Poky Little Puppy: Did you have this book growing up? Of course you did. Now is the time to introduce this classic to your kids. 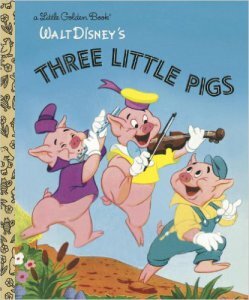 The Three Little Pigs:This is just another example of a classic Golden Book. Plus its Disney. Really any Golden Book will do. How about Rainbow Brite, or Barbie or We Help Mommy? 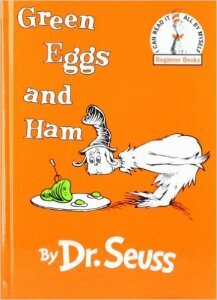 Green Eggs and Ham: I remember having this book memorized. My mom said I used to sit on the couch and "read" it daily. Who didn't love the repetition and the rhymes. If your child has't had the chance to enjoy this book, let's rectify that now! Other great books include Where the Wild Things Are, Mike Mulligan and Mary Ann, and the Little Miss Books. Pop Vinyls: While there are pop vinyls for all range of current shows and movies, lets take it back. Get your kid the characters from Willy Wonka to go with the movie, or get Gizmo, or Jack Skellington. How about the guys from Sesame Street, or Beauty and the Beast. There are so so many to choose from. You really can't go wrong. 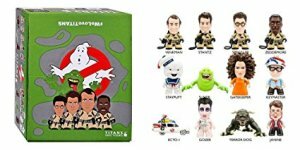 Ghostbuster Titans Vinyl Figures: Remember when the Ghostbusters were all boys? Yeah me too. Introduce your kids to the real ghostbusters with these awesome little figures. Recreate the scene on the roof with Gozer, the key master and Zuul. Drive around with the Ecto 1. Just put on the theme song and get silly! WWE Mystery Minis: This one is great because it is cross generational. You can get current wrestlers like Seth Rollins and Roman Reigns, but also Andre the Giant and Bret Hart. Rewrite history and create matches that could never happen in reality. Note, collecting these can become addicting. My Little Pony Mystery Minis: I'm pretty sure these ponies are making a come back, or maybe they never left. Either way, they were definitely part of my childhood and should be based on. Really, you can just peruse the Funko website and find tons os classic 80's and 90's characters to pass on to your kids. With little to no moving parts, these toys are great for young toddlers. So, if you haven't done your shopping yet, get to it! Happy weekend! !